Yesterday we showed you the exclusive Eurogamer video, in which the developers are telling about the siege of forts in Assassin's Creed 4: Black Flag. Today two new Assassin's Creed 4 gameplay videos were revealed, and this time you will find out more about other naval adventures in the game. Two trailers that we are going to show you are coming from different portals. The first one was presented by Rev3Games and the second one is a continuation of the interview from Eurogamer. The first Assassin's Creed 4 gameplay video tells us more about the underwater experience in the game. It became known that in the sea you will meet a lot of different animals and fish, and most of them will be extremely dangerous. But to find the chest with treasures on the seabed, you will have to avoid them all and to use special air pockets and air barrels. Also you will be able to find treasures in the picturesque caves. 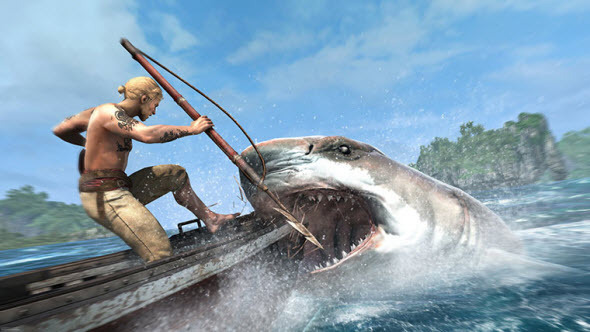 The second Assassin's Creed 4 gameplay video is about shark hunt. Sharks will be very realistic and scary in the game, and also rather dangerous. But if you will learn how to hunt them, the harpooning may become your favorite activity in the Black Flag game.